HE HIPPY MAFIA is the sound of the 21st Century: Ascots meet Afrolistics. Beatles meet Breakbeats. Grace meets Gangster. Psychedelic street funk. 21st Century Commonwealth Soul. When Molasses and FitzDvyne came to Canada from the Caribbean aged 12 they were immediately attracted to Rock and Roll. All the music they had ever known had been Bold, Brash and Rhythmic. So though it seemed odd to everyone else, to them rock and roll represented the freedom to be themselves. So like Gil Scott Heron, Miles Davis and Nina Simone before them they became the Outcasts: the brothers who loved guitars, spoke in riddles and always wore black. But why listen to the Muppets right? Around the same time in England, at the heart of the Commonwealth, in a place called Manchester a whole generation of youth were discovering Brooklyn, break beats, dubstep and dancehall. When the Empire struck back it did so in song. To them it didn’t seem weird to add these new sounds to their former generations’ obsessions from the New World: blues, soul and funk. The result was dancy, funky, raving pop mess. The Stone Roses, The Happy Mondays, Northern Soul meshed with Beatles and Stones and James Brown and Lee Scratch Perry and Sid Vicious and whatever they could get their hands on. A melting pot of groove and culture. The real Empire. So now Manchester has come to Toronto: G Spot, the pulse of the Happy Mondays, Ooblo who learned all the right dance steps and guitar licks and Castro who basked in the afterglow of a 60s hippy hangover. Yes the islanders have landed in Canadiana and are up to their same old tricks: Revolution. 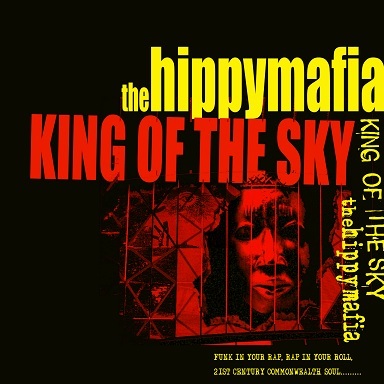 THE HIPPY MAFIA is a living breathing cultural soundsplash. A Celebration, a synthesis, a way of thinking that, like the music, is bold, brash and rhythmic. So what does this mean for you? It means that the old barriers are broken and the old rules are revoked. The Rebel Stylee is yours to claim! Watch closely. And should you witness something jarring that grabs you and won’t let go. Do not be alarmed. It’s no voodoo. It’s the sound of your soul rising to the occasion.